Many marketing experts have weighed in on what they believe to be the reasons for the current backlash against SunChips’s new compostable chip package: excess noise. If you somehow missed it, consumers complained so loudly about the snack food’s new environmentally preferable but noisy corn-based bag that the brand reverted to the old packaging for most of its line. Before we blame consumers once again for not sacrificing a little inconvenience for the sake of the planet, let’s take a step back and understand what really is to blame for the SunChip debacle. This isn’t a failure of consumer conscience so much as a failure of Frito-Lay, which owns the brand, to abide by two critical rules of green marketing: 1) make sure that the brand’s environmental attributes provide clear benefits to consumers; and 2) make sure the cost to consumers of the green attribute doesn’t outweigh the product’s benefits. In this case, consumers didn’t particularly value compostability, while at the same time many found that the “cost” of the bag — it was reportedly so loud that it made it hard to eat the chips and watch TV — far outweighed the benefit, the fun of eating chips. In their zeal to integrate sustainability into their brand, Frito-Lay apparently didn’t look closely enough at how important compostability is to consumers. Most consumers today don’t compost, either in their backyards or in their communities, so the value of compostability as a product attribute is questionable. Yet Frito-Lay heavily touted the compostability message. Its upbeat TV commercial, which was widely circulated on youtube, showing time-lapsed visuals of a SunChips bag degrading accompanied by cheerful music and an eco-friendly message. The SunChips marketing blunder is analogous to the near failed initial launch of Pringle’s potato chips. The brand team focused marketing efforts on the “newfangled” nature of the “perfect” chips and canister packaging, losing sight of the importance of good taste and a fun eating experience. Despite a highly coveted near-universal trial rate, Pringle’s sales volumes quickly dropped when consumers rejected their cardboard-y taste (and artificial preservatives), forcing the brand into a costly reformulation. We’re sure an organization as astute as Pepsico’s Frito-Lay division did its market research homework (as the Pringle’s team did back in the early 1970s), so we’ll probably never fully unravel what happened. Perhaps the scientists and marketers involved simply didn’t take the bags home to their families and test drive them in front of the TV. If there was no way to quiet the crinkly bags, Frito-Lay might have been able to convince consumers that the green benefits of its corn-based bags were worth the cacophony by promising some more compelling benefit than compostability — perhaps that the bags kept the chips fresher, or that, in addition, they’d made the chips more healthful. Unfortunately, without that, Frito-Lay was simply asking customers to pay the same for what had become an inferior product in their eyes — a marketing 101 misstep if there ever was one. SunChips: Thanks for trying. Thanks for continuing to support this eco-friendly innovation by continuing to use the new bags for your Original flavor. And thanks for all the other things you’ve done to integrate sustainability into your business. We look forward to the day when you get the crinkle out. Until then, SunChips — and all brands — be sure not to overlook these green marketing fundamentals in your sustainability strategy. This blog post originally appeared on Harvard Business Review Blog on 10/26/10. Feel free to submit your comments and weigh in on the discussion there. Jacquelyn Ottman is founder and principal, J. Ottman Consulting Inc. a green marketing consultancy, advisors to Fortune 500 companies, the USDA’s BioPreferred labeling program and other clients. 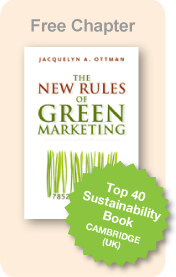 She is also the author of The New Rules of Green Marketing. Mark Eisen is an Atlanta-based environmental marketing consultant and former director of environmental marketing for Home Depot.